As you know, what we have been sharing the last 5 years – particularly through the different Sound the Alarm conferences and DVDs – is that there has been a definite sifting. 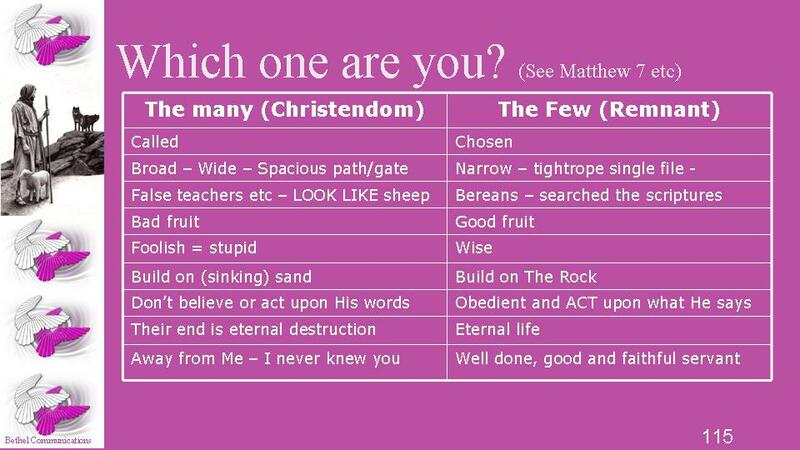 We have 2 groups we call ‘Christendom’ and ‘The Remnant’ (The Body of Christ) and we produced a chart for one of our Watchman DVDs showing The Many Called and The Few Chosen and the differences between the 2 groups. One saunters along the broad road that leads to destruction. The other walks the narrow path few can find – so narrow it is actually a tightrope. One foot in front of the other, stepping not to the right or the left. One ends up hearing the words, “away I never knew you” even though they wrote loads of Facebook posts in His Name and did lots of other things – they spent no time with Him, knowing Him, learning what He actually wants us to do. NOT setting up our own little kingdoms, with everybody doing right in their OWN eyes. The other, much smaller group, will be told “Well done, good and faithful servant”. My fear isn’t just for the millions of un-taught, un-discipled and un-saved in churches – indeed, we are trying to reach those who may have ears to hear through our various tools and devices* – but also for those who think they know this already and yet they do not follow Jesus’ teaching – or any of the New Testament teaching, other than to scout the internet for the next false teacher etc. They spend their time tearing down instead of building up. There is a time for both and God has called a small number of people with a specific ministry to expose the error, but they themselves must be walking uprightly before God, with justice and mercy before doing so – because we are judged with the same measure we judge. Christendom now moves as a Collective Consciousness which is in an Altered State. In the world, they are typified as zombies. They move steadily but swiftly, joining with other factions from across the world, forming a huge supernatural army of sorts. The blind leading the blind. Waiting for their leaders to arise – one from the sea, one from the earth. Paul exhorts us to check we are still in the faith. We also exhort you to check why you believe what you believe. Be absolutely sure that what you believe – and practice – is actually IN The Bible. *Please use the likes of Gv247 for information, Bible Study, evangelization etc. The LampLight Project will also be out soon. We need to show ourselves workmen approved. These are dark days, becoming swiftly darker. We must polish the armour – and never take it off. Click the Pic to visit the Gv247 web channel for a variety of short films challenging you to ask ‘why you believe what you believe’. Deborah came from a background of Eastern mysticism and the occult. Having been gloriously delivered many years ago, she was called into ministry in the late 80s to Sound the Alarm and Communicate Truth. As a respected businesswoman who works in the secular media, she also uses her gifts to encourage The Body and unmask the works of the enemy - relying totally on The Lord as he leads - whether that be in writing, broadcasting, making films or speaking around the world.